Celebrate the holiday season at Gallagher Way, just steps away from iconic Wrigley Field. Get into the holiday spirit with a spin on the ice, a seat on Santa’s lap, a seasonal movie or any of our other holiday and winter events. 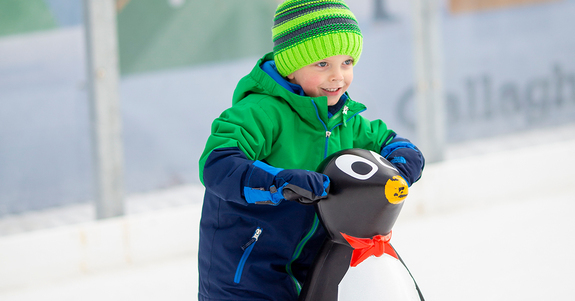 With open ice skating, ice skating classes, curling classes, Chimes at Gallagher Way, Santa's Workshop, holiday crafts, and much, much, more, Gallagher Way has all sorts of activities for your family to enjoy! Sitting in the heart of Lakeview, Gallagher Way offers a beautiful open-air destination for farmers markets, community events, festivals, dining and much more. Gallagher Way serves as a year-round gathering place for neighbors, families, fans and visitors. NPN members get 50% off skate rental for your entire party, up to six people. Average skate rental is $10/rental. Offer expires January 27, 2019. Click here to find out to how to redeem the discount.